My dear old grandma, Grace sadly passed away in January aged 88. She had a good innings but still she deserved to live a lot longer, a very happy and kind lady who lived through two wars. 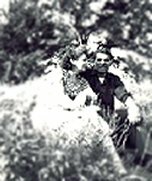 She married Stanley W. Rogers and had three children by him the first being Terry, followed by Monica and last the only one now left my aunt Marcia. She brought them all up with family values, and during the Second World War she and the children were evacuated to Bude in Cornwall, now at the time of this she was living in Eltham, London, so travelling to and from Bude became a regular occurrence. She worked at the Woolwich Arsenal in between and after the war until retirement. After the war had ended, the family moved to Welling and then on to Plumstead, both in southeast London. Family holidays were at the Kent coast and Hop picking, my gran loved Hop picking. Gran & granddad worked hard to support the family and gave my father and he's sisters as much as they could. 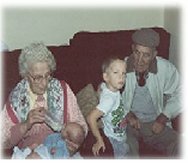 A very close family, family party's with granddad playing the piano and the whole family jolly and happy, those were the days. The things that stick in my mind about gran are ice creams in the local park near where gran lived and gran hiding in the cupboard under the stairs whenever it was thunder & lightning outside. Also going to visit gran on a Sunday afternoon with my friend, and gran saying " would you like to draw" with the answer " yes" she would open the big sideboard up and in there she had blue paper and white, I would always ask for the blue as this was special. Gran loved to watch snooker and read books, she also loved doing puzzles. A very simple lady in respect of she didn't want much from life, just a good family, and a very special gran to me and the rest of the grandchildren. Grandma you was so special to all of us, and we will all miss you so very much. You were so kind to us and such a loving lady, our gran you were the best without a shadow of doubt. Keep safe gran and say hello to all the others, and look after them like you did when you were all here with us. Lots of love your daughter Marcia and you're Grandchildren and Great-Grandchildren & your Great, Great-Grandchildren.